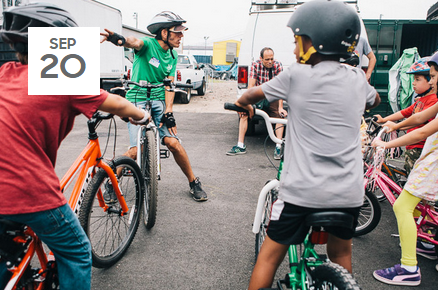 Learn to Ride—Kids is a free group class for children who are ready to ditch their training wheels and ride a two-wheeler for the first time. With our safe, easy, effective method and experienced instructors, kids will learn how to balance, pedal, start, stop, and steer a bicycle. Most students get the hang of it in one session, but even if they don’t, parents will leave equipped with an easy, low-stress technique that will have their kids riding independently in no time. Availability of loaner bikes: N/A. Kids must bring their own bike and helmet. Registration policy: Advance registration is preferred; walk-up students are accepted if space allows. *Parents must ensure that the bicycle fits their child and is in good working order (i.e., wheels spin freely, brakes function). The child must be able to rest his or her feet flat on the ground while sitting on the bicycle seat. Training wheels should be removed in advance and tires should be inflated until they are hard.